SPRING BREAK U-PICK VEGETABLE TOURS - No Reservation Needed! SPRING BREAK U-PICK VEGETABLE TOURS! Due to crop unavailability due to rain and other factors, we will be switching the remainder of the Spring Break Strawberry Tours to U-Pick Vegetable Tours. We will also be CANCELLING ALL TOURS ON WED, 3/20, and THU, 3/21, due to heavy rain in the forecast. 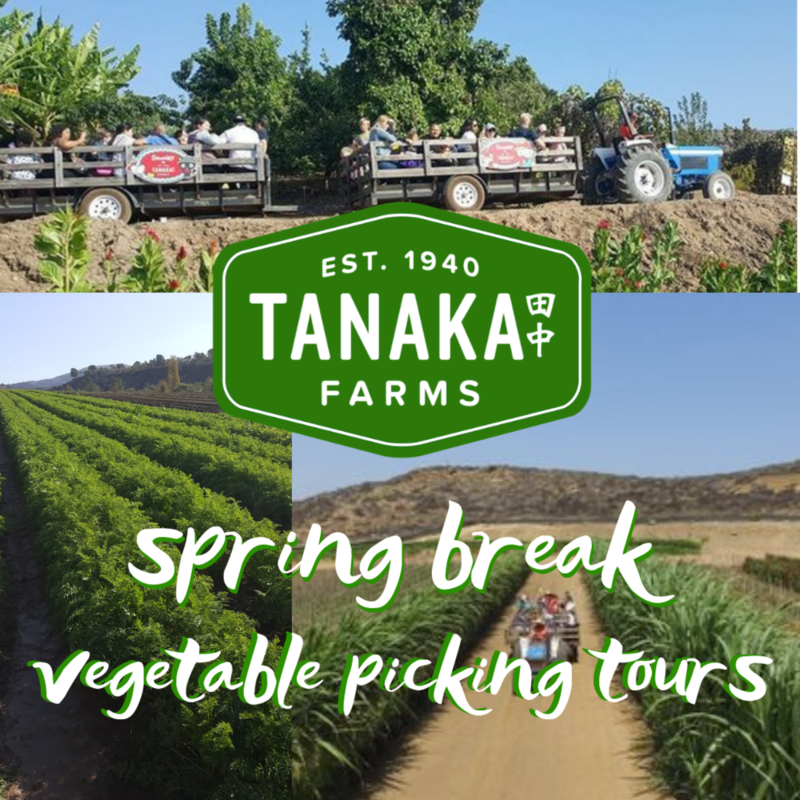 Spend Spring Break at Tanaka Farms picking vegetables! We will have walk-on U-Pick Vegetable Tours Monday Through Friday at 9:30am, 11am, 1pm, and 2:30pm beginning March 11th and ending on April 19th. A friendly Tour Guide will teach you about how vegetables grow! Make several stops in the field to pick your own veggies to bring home. This week we will be picking Sugar Snap Peas, Celery, Carrots, Swiss Chard, and Romaine or Green Leaf Lettuce! The wagon ride is FREE! Only pay for what you pick at the same price as is the Produce Market Stand. For example Sugar Snap Peas are $3.49 a box, while Broccoli is $2.99/pound. IMPORTANT NOTE: This is a real working farm and tours are subject to weather and crop availability. Check our website and Facebook for updates.